OVER THE WAVES The Song of a Soldier on the Way to France (Written to the rhythm of the music of the waves on the Atlantic.) 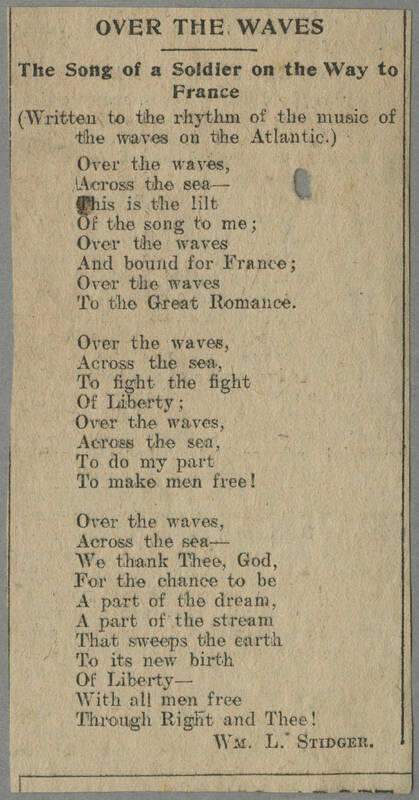 Over the waves, Across the sea--- This is the lilt Of the song to me; Over the waves And bound for France; Over the waves To the Great Romance Over the waves, Across the sea, To fight the fight Of Liberty; Over the waves, Across the sea, To do my part To make men free! Over the waves, Across the sea--- We thank Thee, God For the chance to be A part of the dream A part of the stream That sweeps the earth To its new birth Of Liberty--- With all men free Through Right and Thee Wm. L. Stidger.